The roar of a crowd during a pro football game can be deafening. But look down at the sidelines and you’ll see players and coaches tuning out the sounds to focus on what they’re going to do on their next drive. Look closely and you’ll see they’re using Microsoft Surface Pro tablets to help them plan those plays. Going into their fourth season with the teams, Surface tablets are a familiar and ubiquitous sight before, during and after pro football games. Consumers can also focus on football too, and enjoy it more through Microsoft apps and other experiences new to this season. Fans can also enjoy watching Thursday night games without a need for cable subscription through Twitter live streaming, which they’ll be able to access through the Microsoft NFL app on Windows 10 devices and Xbox One. Plus, fantasy football fans will find new features that can help them win within their leagues, making timely choices for their rosters thanks to updated Next Gen stats on their favorite players in the apps. Also new this year: the Microsoft Surface Special Edition NFL Type Cover, with designs for all 32 teams. A player holds a Surface Pro 4 to check out a play. Updated Surface Pro 4 devices – “The Official Tablet of the NFL” – designed specifically for the NFL – replace the Surface Pro 3 tablets players and coaches used during the Super Bowl 50 season. Teams started using Surface Pro 4 devices in this year’s preseason, and will be using them through the regular season. Right out of the box, they come with improved daylight readability, better battery performance and easy access to a pen that’s indispensable on the sidelines, especially in wet weather. These devices are lighter, enclosed in a thinner, redesigned case that’s still rugged enough for games played in harshest winters, wettest days and searing heat. 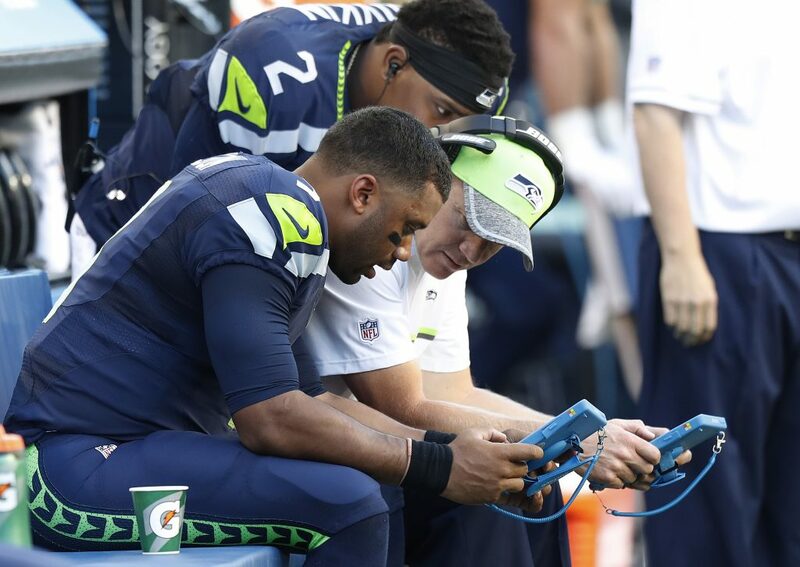 The NFL provides the specially equipped devices, which include Microsoft’s Sideline Viewing System (SVS) app introduced two seasons ago, to all 32 teams on game day. The app enables coaches to analyze full-color images from a previous offensive or defensive series and plan their next plays more efficiently and quickly. After several seasons of using the devices, coaches have come to rely on them more than ever. “We live and die by those things on the sidelines,” says Brandon Fisher, defensive backs coach for the Los Angeles Rams. “When we’re not on the field we are adjusting, and everybody is surrounding the one Surface. That’s our livelihood on Sundays, those things.” He added that it’s helpful to have four focused pictures that they can zoom in on, rather than two black-and-white photos. Staff all over the NFL praised the tablets’ long battery life, reliability, and how the devices help them make quicker adjustments. Others mentioned how watching videos is a much better way of seeing how plays unfold, vs. trying to guess from photos what is happening. Tran says a growing number of staff across a team continue to use the devices, especially during crucial moments, such as the two-minute drill and in the final quarter. Behind the scenes, teams are still using off-the-shelf Surface devices to increase their productivity off the field. For administrators and those involved in business operations, the devices are all-in-one solutions for a wide range of needs, such as arranging logistics, performing data analysis, checking out film and keeping track of notes between games. At home, fans can experience all the excitement of game day on their own devices. Two years ago, fans began experiencing fantasy football (CBS, Yahoo and NFL.com) on the biggest screens in their house – their TVs – alongside live games for an immersive experience through the magic of split-screen snapping on the Microsoft NFL app for Xbox One – “The Official Game Console of the NFL.” Last year, that app became available on Windows 10 PCs and tablets as the ultimate second-screen experience. It’s been updated with several features. For instance, on Xbox One, you can share video highlights and also save ones you like. Besides a redesign of the apps on both the Xbox One and Windows 10 that will show leaders and top playmakers throughout the season by stats, there are new additions to the Next Gen Stats. Now fans can see the longest total distance offensive players traveled until they got tackled (“Workhorse”) and players that are fastest on a single play (“Afterburner”); and for the first time, later this season, they can see the defensive players with the fastest quarterback sacks and players who cover the most total distance in making a tackle. “Our audience loves very specific information,” Tran says. Users will also be able to stream live up to 10 Thursday night games thanks to Twitter through the app, without the need for a cable subscription. There are additional options too. Fans who want to watch every game through both apps can buy NFL Game Pass or the NFL Sunday Ticket on Direct TV (for Xbox One only). If you have Game Pass, you can watch a condensed version of the game of your choice on Windows 10 or Xbox One. With NFL Now, you can watch clips, get news and see big plays. Whether you’re a fan in search of more information to better your odds of winning your fantasy football, a coach who uses the Surface Pro 4 to go over plays with a quarterback or a scout who needs to watch films and write reports, Microsoft makes it easier for you to do what you love and be more productive, too.